Ranked No.4 in the nation based on 2015 Harley-Davidson Bar and Shield scores, Black Wolf Harley-Davidson has shown its dedication to its customers and its commitment to furthering the Harley-Davidson brand. The Bristol, Virginia-based dealership is the recipient of the 2015 Harley-Davidson Platinum Circle of Distinction, which uses criteria from multiple points within in the dealership, including customer satisfaction scores and new motorcycle profitability. “We promote the platinum award out in the marketplace pretty heavily, and we also thank our customers for it,” said John Ward, managing partner at Black Wolf. The dealership’s overall CXI score is 9.7 out of a possible 10, which Ward says played a large role in achieving the Platinum Circle award. Harley-Davidson also looks at other aspects of the dealership, such as MotorClothes, service and PG&A metrics. Black Wolf Harley-Davidson is ranked No.4 in the nation based on 2015 Harley-Davidson Bar and Shield scores. Ward views these rides as a great opportunity for him to get to know his customers outside of the dealership. “We are also blessed with an awesome HOG chapter. I ride with the chapter as often as I can, including the annual Virginia Chapter Challenge, which we have won several times. We also partner with our chapter for the majority of our larger events and fundraising opportunities, including our annual Christmas Party,” said Ward. 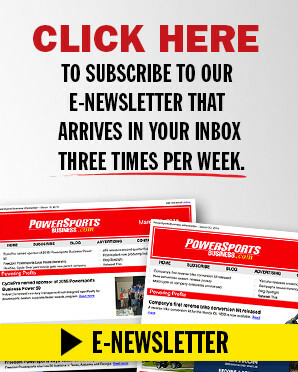 In its 2016 Power 50 application, the dealership mentioned its Riding Academy, which has grown with the interest of new riders. “We’ve had a really successful Riding Academy program, and Scooter is a really big part of that,” said Ward. In fact, the dealership’s program is so popular that its classes are offered every weekend and are often booked due to the 12-person limit. The two-day classes take place Saturday and Sunday, with an over 99 percent graduation rate. While a lot of the advertising for the Riding Academy is word of mouth, the dealership also uses social media and radio to get the word out. Ward said the local police department, prior military, EMS and first responders are among those who have enrolled in the Riding Academy this year due to Harley-Davidson’s program, Heroes Ride Free. Also, a buddy system has emerged of siblings, spouses and friends taking the class together, a trend the dealership thinks will continue into 2017. In addition to its awards, Black Wolf made a commitment to improve its dealership over the past year to continue growing its outreach demographics and increase its business identity throughout the community. 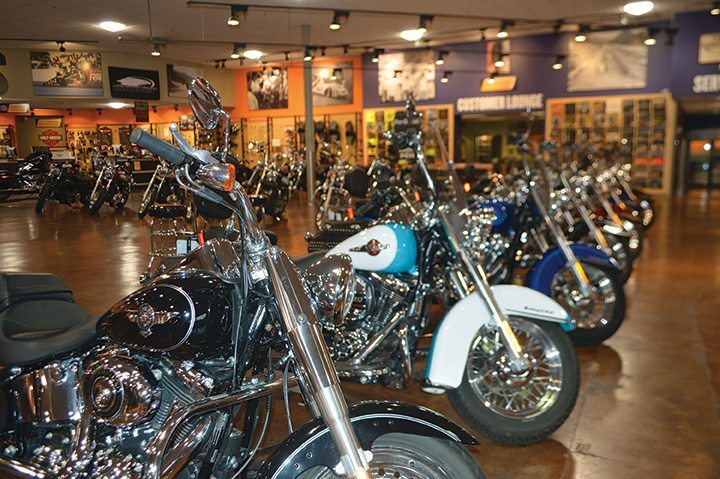 In 2015, 36 percent of the dealership’s new bike sales were sold to non-core Harley customers. In order to reach a younger audience, the dealership launched a mobile app last year. In its first year, more than 700 mobile users have downloaded the app. 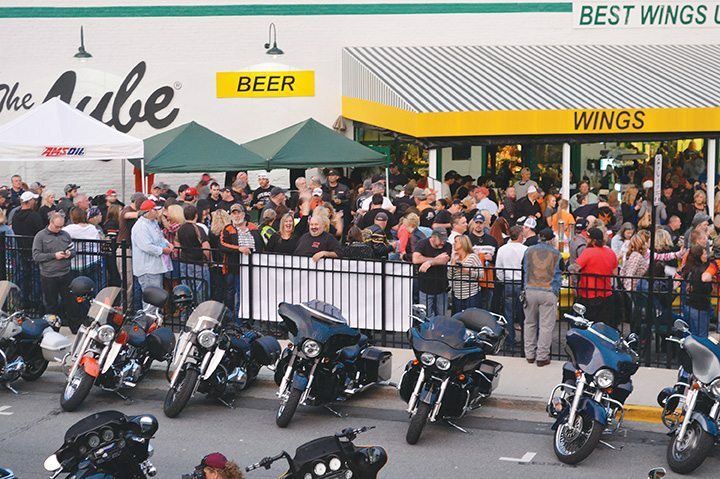 The dealership has partnered with local businesses such as Quaker Steak & Lube to host bike nights in Bristol, Va.
Pendergrass added that the female demographic has also seen a lot of growth in the dealership. Black Wolf now offers Ladies’ Nights to cater to its female riders. “We have vendors that ladies would like to come see, and we don’t allow men besides our employees that are helping with the event. That has been really big,” said Pendergrass. During Ladies’ Night events, participants can demo the dealership’s Jumpstart machine and see what it is like to ride a Harley and shift the gears. Ward added they even have a fan, so riders can get the feeling of air rushing by them while riding. Pendergrass hopes that like the Ladies’ Night events, the dealership will host a few events geared for younger riders beginning early 2017. “We’re going to plan something and get it out hopefully right at the beginning of the year before Riding Academy starts, so we can get some of those who don’t know how to ride enrolled and go from there,” he added. The dealership has made efforts to expand its event offerings and offer more events during normal business hours. Black Wolf has partnered with local businesses, including the Quaker Steak & Lube restaurant, to host weekly bike nights in Bristol. These bike nights run Thursdays from May until the end of October. Black Wolf hosts a block party the first Thursday of every month, with the city allowing the dealership to take over one of the streets in downtown Bristol for a night of fun and camaraderie. The block parties have drawn as many as 500 bikes at a time.